Central Maine Power's proposed route to transport Canadian hydropower to Massachusetts. The staff of the Maine Public Utilities Commission has recommended approving Central Maine Power’s $1 billion plan to transport 1,200 megawatts of Hydro-Quebec electricity to Massachusetts. The contract to provide renewable energy to the Bay State was originally awarded to Northern Pass but was withdrawn after New Hampshire regulators denied Eversource’s application to build a $1.6 billion powerline on Feb. 1, 2018. The New Hampshire Supreme Court just announced that on May 15, it will hear oral arguments on Eversource’s appeal of the Site Evaluation Committee’s denial. The New Hampshire SEC denied Eversource’s application to build a 192-mile high-voltage transmission line from Pittsburg to Deerfield saying the project would unduly interfere with the orderly development of the region. 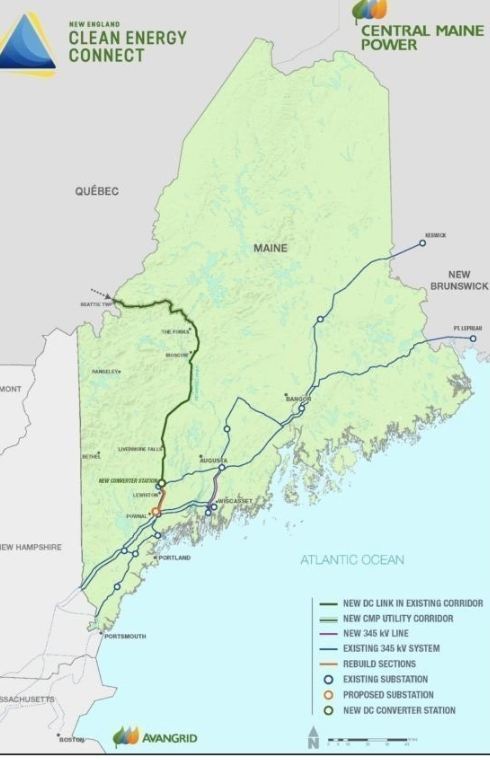 Central Maine Power’s New England Clean Energy Connect proposal to build a $1 billion, 145-mile transmission line through western Maine was selected to replace Northern Pass to fill the Massachusetts Clean Energy RFP to transport Canadian hydropower to the Bay State. While not the final word, the 162-page hearing examiners’ report by the Maine PUC staff that was released Friday was welcomed news to supporters and CMP’s parent company, Avangrid. And bad news for opponents, who became more organized and vocal once the NECEC project was selected for the Massachusetts contract. The examiners’ report contains the recommendation of the Commission staff and provided the caveat that although it is in the form of a draft Commission order, it does not constitute Commission action. “The Commission finds that the construction and operation of the New England Clean Energy Connect (NECEC or Project) is in the public interest and, therefore, there is a public need for the Project,” the report said. The staff carefully weighed the benefits and costs of the project to ratepayers and residents. “In addition to the wholesale electricity price reductions, the project will also enhance system reliability and fuel security within Maine and the ISO-New England region,” the report said. The Portland Press Herald reported that opponents plan to continue fighting the controversial project. “On behalf of the Say NO to NECEC effort, we are disappointed by the recommendation by the PUC’s Hearing Examiners stating that NECEC is in the public interest,” Sandra Howard, the group’s spokeswoman, told the Portland newspaper. “There’s nothing in this report that changes the facts that this transmission corridor is a bad deal for Maine and it’s deeply unpopular,” she said. The staff conceded that effects on scenic and recreational values, and the associated impacts on tourism and the economies of communities in proximity to the project “are adverse and significant. The project will provide environmental benefits by displacing fossil fuel generation in the region, and the associated greenhouse gas, according to the report. And will benefit the Maine economy through more than 1,600 jobs expected to be created during construction, and through property taxes, the report said. It will also provide rate relief and benefits for low-income customers, and support programs that will benefit Maine communities and the environment, the report said.